The 1961-62 Fleer Basketball set is known for including the first mainstream basketball cards of many basketball all-time greats such as Elgin Baylor, Wilt Chamberlain, Oscar Robinson and Jerry West. The 1961-62 offering was the only major basketball set issued by Fleer until the 1986-87 season. The 1961-62 Fleer set featured cards of 44 different players and consisted of 66 cards in total, thus cards #'s 45-66 were action shots of players pictured elsewhere in the set. We've just acquired a collection of 150 of these cards that are online and ready to sell! In this collection were multiple stars including: # 36 Oscar Robertson, # 44 Lenny Wilkins RK, and # 66 Jerry West. 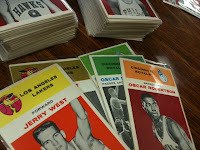 So head on over to DeansCards.com and check out our offering of 1961-62 Fleer Basketball Cards. Also, if you are interested in buying Basketball Cards, check out the 1986-87 Fleer Basketball Cards.